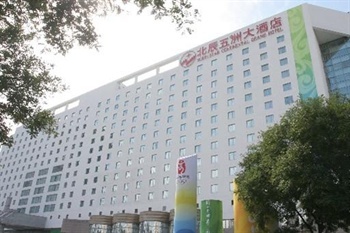 Located in the scenic Olympic Games Village, the Beijing Continental Grand Hotel (Beijing Wuzhou Dajiudian) is within walking distance of the Bird's Nest and Water Cube, and only a ten-minute drive from Zhongguancun Science Park. This hotel comes equipped with modern facilities and provides an excellent standard of service. Offering a variety of rooms, such as deluxe suites, panoramic rooms and a business queen room, this Beijing hotel has everything to suit the guests' needs. The on-site restaurants serve local Chinese cuisine and Western cuisine for those in need of some home comforts. There are also function rooms, a ballroom and private dining rooms available for banquets or other events. Conference rooms and professional services are on offer to accommodate all business requirements.A beauty salon and massage parlor allow guests a chance to relax, while the ballroom and private karaoke rooms offer a perfect opportunity to unwind.